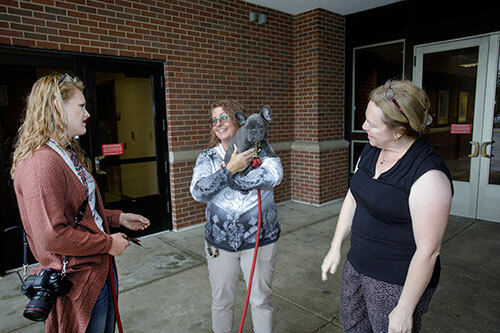 PVM United Way volunteer Andi Waibel holds Carl, a French bulldog belonging to Paige Kiger (left), as Gwen Wallace, Basic Medical Sciences Department lecturer admires the cute puppy. Given the Purdue University College of Veterinary Medicine's history of advocating for the positive benefits of human-animal interaction, it should be no surprise that members of the Purdue Veterinary Medicine family took advantage of a chance to raise money for United Way by cuddling puppies and dogs Wednesday afternoon, October 11. Several cuddly canines and their owners were on-hand for the event at the east entrance to Lynn Hall. For $1 per cuddle, United Way supporters could spend some quality time with the furry canine companions, and have their name entered in a drawing for door prizes. The Puppy Cuddles for United Way event was a howling success, raising nearly $60, or double the amount raised last year! Thanks to all involved, including the canines and their companions, and the event coordinator, PVM United Way Campaign volunteer Andi Waibel, who is the department secretary for Basic Medical Sciences. Next up on the United Way Campaign fundraising schedule is the Pumpkin Contest. Pumpkins must be submitted by noon on Monday (October 23). Andi also reminds everyone, if you haven't done so already, to login to the United Way ePledge system and select the "donation" OR "no donation" option, ASAP. Once you log in and make your choice, you are eligible for random prizes! PVM Dean Willie Reed is this year's Purdue United Way Campaign chair. The theme for this year's campaign is "United We Win." Julie Lewellen (right), secretary to the head of the Department of Comparative Pathobiology, calls to attention her German shepherd, Athena, and two other canine participants in the Puppy Cuddles United Way fundraising event, King (left), a pit mixed-breed dog owned by Caitlin Smith, of the DVM Class of 2019, and Hudson, a Labrador and former teaching dog owned by Jesse Whitfield, also of the DVM Class of 2019. 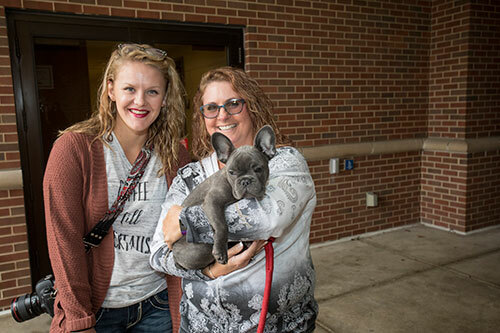 Puppy Cuddles event coordinator Andi Waibel with her friend Paige Kiger (left), who brought her cuddly French bulldog, Carl, to the United Way fundraising event Wednesday (October 11) at the east entrance to Lynn Hall.